I’m usually not one for clichés but I must admit that spring is definitely in the air; if not evidenced by spastic sneezing fits and confused wardrobe selections (is it a hot day or a cold day? 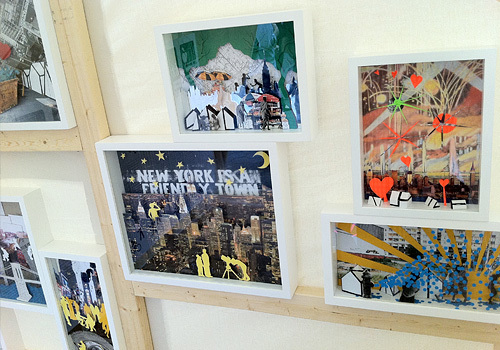 ), spring’s arrival is clearly signaled by an abundance of activities and outdoor festivals in NYC. As the city sheds its scarves and wool coats, there is much to look forward to this season. 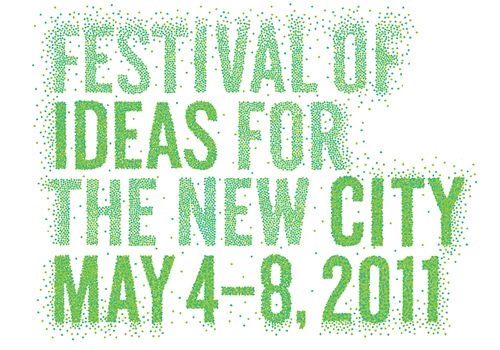 Festival of Ideas for the New City is a major new collaborative initiative in New York involving scores of Downtown organizations working together to harness the power of the creative community to imagine the future city and explore ideas that will shape it. Their lineup of talks, workshops, exhibits and booths was staggering, spanning a good part of the Lower East Side. Struck with option overload, I decided to give up on planning specific sites to visit and just wandered around Sarah D. Roosevelt Park, where most of the action was. 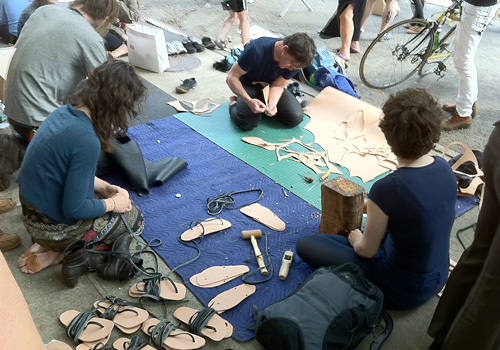 There were people making sandals right on the sidewalk! This is just a small glimpse of what the event had to offer; workshops, talks, and exhibits were also part of the week-long festival program. I was fortunate to hear from others what their experience was of the parts I missed (generally positive, although there was some consensus on poor event navigation and usability of event programs and maps). Overall, I think this event succeeded in not just redefining notions of what a public event could be, but also in reaffirming the power of creativity to help build community. Nonprofits working to improve life in the city had an excellent platform to gain support for their causes. I spent some time learning about the great work of Transportation Alternatives, New York City’s advocacy organization for bicycling, walking and public transit, and Safari 7, an educational project with the MTA to teach people about the different forms of life at each stop along the 7 line. In many ways, this festival also represented a renewal of the spirit of New York arts. After what seemed a Dark Age of artistic output brought about by the economic downturn, it was inspiring to see an energy and vitality once known in Greenwich Village during the early to mid-1980’s. Just seeing young families at craft booths and play areas seemed to indicate that the specter of financial doom was lifting and that it was okay to celebrate art and design again. Or at least, that was my impression. I’m curious to see what’s in store for next year’s festival, if there is one. 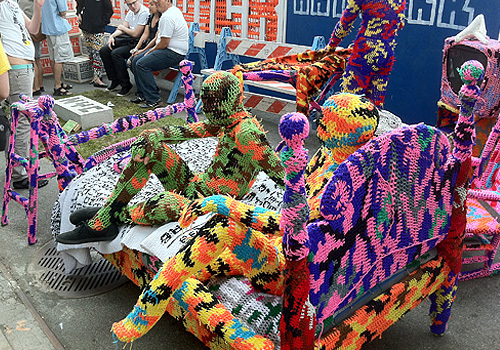 Anyhow, I love this: “reaffirming the power of creativity to help build community.” I find it incredible that creativity can build community despite all kinds of obstacles–distance being only one of them. Thanks, Chris. Yes, I did tweet a few pics. This past weekend was something entirely different (post coming soon). 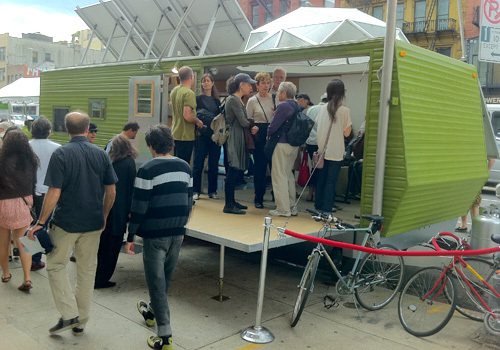 It’s easy for folks around here to get jaded about arts events in NYC, but given the social and economic context, the Festival of Ideas was symbolic of what art and design do to bring all kinds of people together. 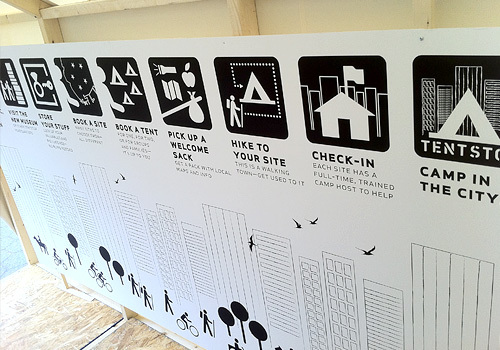 And it showcased the many ways people are already working towards the greater good, which often get overlooked. I’ll be sure to keep you posted if there’s another in the works for 2012.